From left to right, DCJS Executive Deputy Commissioner Michael C. Green, State Police Technical Sgt. Brian D. Rumrill, Madison Popolizio, Blake Alois, State Police Technical Lt. Peter McLain, and State Police Superintendent George P. Beach II. Governor Andrew M. Cuomo today announced the first-ever recipients of the Division of Criminal Justice Services' inaugural Lifesaving Award. Technical Lt. Peter R. McLain and Technical Sgt. 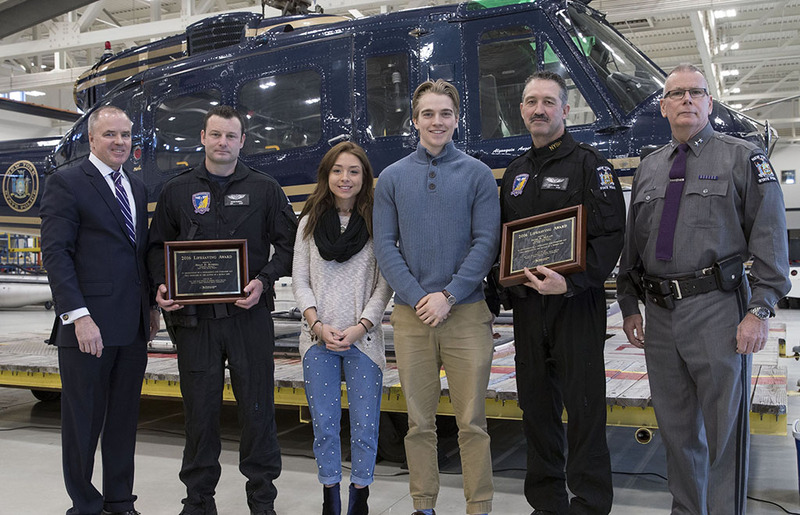 Brian D. Rumrill of the New York State Police Aviation Unit were honored for their role in the rescue of a pair of young hikers who fell from the snow-covered summit of Algonquin Mountain in December 2016. 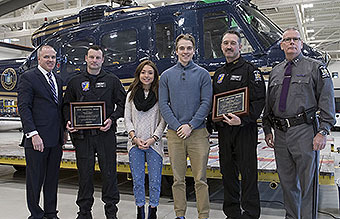 The helicopter pilot and co-pilot braved strong winds and dangerous winter-weather conditions to rescue the hikers who were stranded for two days in sub-zero temperatures. "The actions of Technical Lt. McLain and Technical Sgt. Rumrill exemplify the courage and bravery of New York's first responders," Governor Cuomo said. "I am proud to honor these individuals for their selfless rescue efforts and thank them on behalf of all New Yorkers for their service." The Lifesaving Award was created last year by the Governor's Police Officer of the Year Award selection committee in response to the many nominations it receives involving police officers who performed heroic acts during life-threatening emergencies. Technical Lt. McLain and Technical Sgt. Rumrill were among 13 officers nominated by their agencies for the Police Officer of the Year award, which was presented to Syracuse Police Officer Kelsey Francemone last fall. The two Troopers and other nominees received a Certificate of Exceptional Valor from Governor Cuomo during the Police Officer of the Year selection process. The committee aims to present the Lifesaving Award to Police Officer of the Year nominees whose courageous and unselfish acts resulted in the saving of a human life. DCJS Executive Deputy Commissioner Michael C. Green joined State Police Superintendent George P. Beach II to present the award during a ceremony this morning at the Aviation Unit's headquarters at the Albany International Airport. The rescued hikers, Blake Alois and Madison Popolizio, attended the ceremony along with their families. Alois, then 20, and Popolizio, 19 at the time, went missing after ascending the 5,115-foot-high peak on Dec. 11, 2016. The hikers became disoriented upon reaching the summit amid a snowy fog that enveloped the mountain. While searching for the trailhead, the hikers became stranded about 100 feet off the summit and fell into snow-covered trees below. State Troopers and Department of Environmental Conservation Forest Rangers were called to search for the couple after they were reported missing at nightfall, but were hampered by winter weather and poor visibility, including conditions bad enough to require one group of Forest Rangers to spend the night in the mountain's back country. The poor weather grounded Technical Lt. McLain and Technical Sgt. Rumrill until two days into the rescue effort when conditions improved marginally enough for their helicopter to take flight and reach the summit. Though conditions made it too difficult to locate the trapped hikers at first, the sound of the helicopter served to alert them to the rescue effort and shout to nearby Forest Rangers on foot. Once located, both hikers were suffering frostbite and hypothermia, making it too dangerous to safely evacuate on the ground. Technical Lt. McLain and Technical Sgt. Rumrill attempted to breach the summit's cloud cover about a dozen times before spotting a roughly 45-second break that allowed them to steady the helicopter long enough to allow Forest Ranger Ian Kerr to hoist the hikers aboard and be flown to safety. The aviators then returned to the mountain to extract a pair of Forest Rangers exhausted from the search and at risk of being stranded themselves. The rescue was captured on video and in photos. DCJS Executive Deputy Commissioner Green, Chairman of the Police Officer of the Year Committee said, "Law enforcement officers are frequently the first to arrive on the scene of life-threatening emergencies and play a critical support role in assisting other first responders. This award recognizes those feats of heroism where an officer went above and beyond the call of duty to help save a life or lives. Certainly, the exemplary actions of Technical Lt. McLain and Technical Sgt. Rumrill during the harrowing December 2016 rescue on Algonquin Mountain capture the intended spirit of the Life-Saving Award." State Police Superintendent Beach said, "Technical Lt. McLain and Technical Sgt. Rumrill are exemplary selections for this new award. I once again applaud their superior work that day. The skill and perseverance these pilots exhibited during the rescue effort on Algonquin Mountain undoubtedly saved two hikers from almost certain death and prevented other teams of rangers from suffering further exposure to the harsh winter elements. Their actions stand testament to the selfless courage we see day after day within the New York State Police." Department of Environmental Conservation Commissioner Basil Seggos said, "The rescue of Blake Alois and Madison Popolizio took place in some of the most brutal winter conditions we encounter in the High Peaks and is a testament to the great work that happens when agencies combine forces. I salute Technical Lt. McLain and Technical Sgt. Rumrill for their skill and resolve that day, and thank NYSP Aviation, which assists our Forest Rangers in dozens of missions each year."